About Us - cfm - Wisconsin supplier of Erosion Control Products, Straw Blankets, Geotextiles, Silt Fence, Drain Tile, Polymer, Silt Sock,Gabions, and more! 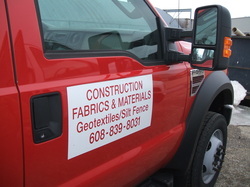 Construction Fabrics & Materials is one of the leading suppliers of geotextiles and erosion control products in the Midwest. For more than 25 years, we have provided the construction and landscape industries with phenomenal service, product support and technical knowledge regarding soil reinforcement, geotextiles and erosion control materials. Through a combination of standard and custom designed products and services, we have created the most diverse line of geosynthetics and bio-engineered solutions available. We supply our products and services to projects throughout the United States from our shop in Cottage Grove, Wisconsin. With a long standing reputation as a leading supplier of geotechnical solutions, make CFM your choice for all of your erosion control and geotextile needs.